The Sidekick is one of the most popular sampling pump meters around. It is a precision sampling multi-function pump for high and low sampling. This product is highly reliable and simple to use because it has been built to withstand the toughest of environments. This standard pump comes without ATEX approval or a timer. However the Sidekick is available in different models with intrinsically safe models which come with ATEX or UL approval with an optional elapsed timer. A snap-shut case controls the Sidekick so the unit cannot be accidentally shut off whilst it is in use. The Sidekick has a flow range of 5-3000 millilitres per minute. Additionally a CPC and a low flow adapter provide the option to sample gases and vapours for up to 500 millilitres per minute. Supporting multi-tube sampling at the same time from one pump all at different flow rates is an advantage of this system. The Sidekick is a popular choice because it has the ability to sample for different hazards without needing more than one pump. 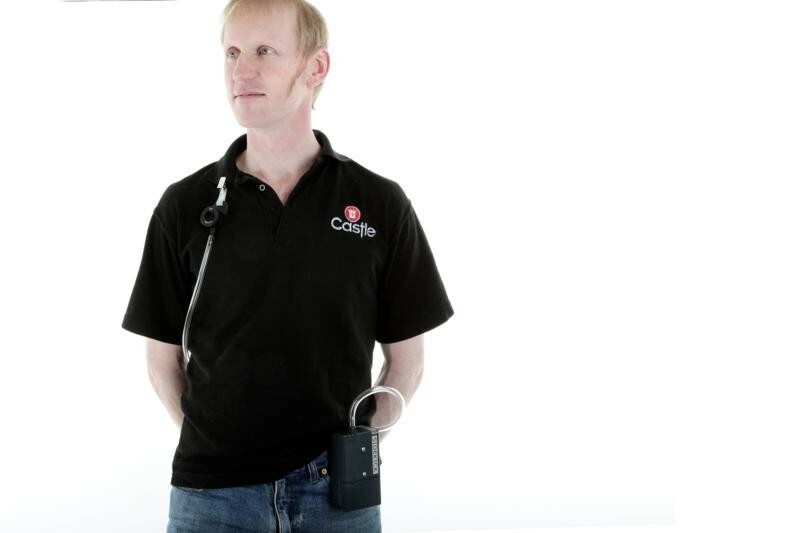 As the controls are under a "snap down" cover it prevents accidental operation, therefore it has been proven to be a winner with safety managers and hygienists. 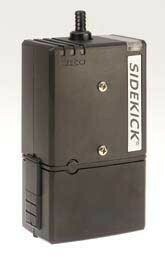 The Sidekick is available in a number of different variations depending on your requirements. 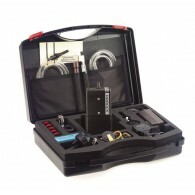 Basic Kits include Carry Case, Mini Tool Kit, Battery Charger, 1m Tygon Tubing, Instruction Manuals and Step-By-Step Guides. 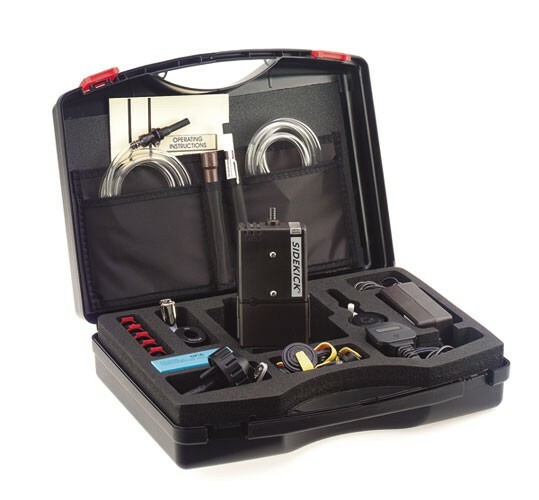 Vapour Kits also include Plastic IOM Multi-vapour Sampler and 4 Cassettes, Plastic Cyclone and 4 Cassettes, 5 Filter Transport Cassettes, 100 Glass Fibre Filters. 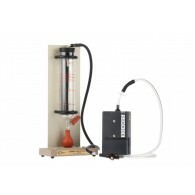 Gas/Vapour Kits also include Single Adjustable Flow Holder, Type A Protective Tube Cover. Please Note. A Filter Medium will also be required. Due to the large number of filter mediums available we will contact you to find out your specific requirements. Paper and Sorbent filter mediums are all priced separately. Sidekick Standard pump with NiMH battery pack, and single charger, screwdriver set, Sidekick Step by step guide, single adjustable tube holder, constant pressure controller, protective tube cover, lengths of Tygon tubing (1 metre long), tube breaker and operating manual in a carry case. Sidekick Intermediate pump with NiMH battery pack, and single charger, screwdriver set, Sidekick Step by step guide, single adjustable tube holder, constant pressure controller, protective tube cover, lengths of Tygon tubing (1 metre long), tube breaker and operating manual in a carry case. Sidekick Deluxe pump with NiMH battery pack, and single charger, screwdriver set, Sidekick Step by step guide, single adjustable tube holder, constant pressure controller, protective tube cover, lengths of Tygon tubing (1 metre long), tube breaker and operating manual in a carry case.